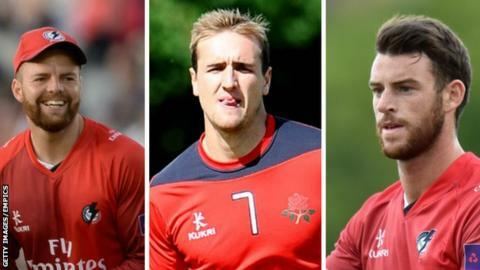 Lancashire's Arron Lilley, Liam Livingstone and Jordan Clark have all signed new deals with the club. All-rounder Lilley, 24, took his best figures of 5-23 in the win over Derbyshire earlier this season. Batsman Livingstone, 22, hit a world record one-day score of 350 playing for Nantwich in April and has been a key part of the Red Rose's T20 side. Clark, 24, was the first Englishman to hit six sixes in an over and the all-rounder has been a regular this year. The lengths of the contracts have not been disclosed. "It's great to have them on extended contracts," head coach and director of cricket Ashley Giles told BBC Radio Lancashire. "They're the future of Lancashire cricket, so to retain their services for the foreseeable is great for the club."